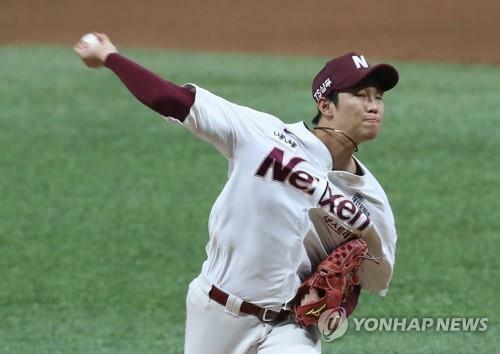 SEOUL, Oct. 23 (Yonhap) — The 2018 Korea Baseball Organization (KBO) postseason is quickly turning into a coming-out party for the Nexen Heroes’ rookie right-hander An Woo-jin. The 19-year-old threw his second straight scoreless game out of the bullpen on Tuesday, helping the Heroes defeat the Hanwha Eagles 5-2 in Game 4 of the first-round series. The Heroes won the series 3-1, and An was credited with two wins. An earned his first postseason victory in Game 2 last Saturday, when he pitched 3 1/3 shutout innings and struck out five in the Heroes’ 7-5 win. Two days after throwing 51 pitches, An was back on the hill in Game 4 and ended up making 72 pitches in a gutsy performance. He relieved fellow 19-year-old Lee Seung-ho with one out in the fourth and runners at the corners. An allowed one inherited runner to score on a groundout, but continued to keep the Eagles’ hitters at bay over the next 5 2/3 innings — all the while showing the poise and gumption of a seasoned veteran. With no viable starter left in the rotation, this was supposed to be a bullpen day for the Heroes. But Lee, who battled control issues early, hung tough and pitched into the fourth inning. Then An made sure the club wouldn’t need another pitcher. Of An’s five strikeouts Tuesday, the two biggest Ks came in the seventh inning. With the Heroes clinging to a 3-2 lead, the Eagles had a man at first with one out and the heart of their order coming up. Clearly unfazed, An struck out No. 3 hitter Jared Hoying, who fanned on a slider in the dirt. Cleanup Kim Tae-kyun, who drove in the winning run in the ninth inning of Game 3 on Monday, went down swinging on a fastball clocked at 152 kilometers per hour (94.4 miles per hour). It was An’s fastest pitch of the game. In the eighth, An gave up a leadoff single to Lee Sung-yul. But the next batter, Ha Ju-suk, struck out swinging on a 149 km/h fastball after failing to lay down a sacrifice bunt. An then induced an inning-ending, 6-4-3 double play ball off the bat of Choi Jae-hoon. The Heroes finally gave An some breathing room in the bottom eighth, when Lim Byeong-wuk, voted MVP of the series, drove in two runs with a triple. And An returned to the mound in the ninth. It began ominously enough, as pinch hitter Kang Kyung-hak lined a leadoff double down the right field line. But An got a line drive out, pop out and fly out to send the Eagles home. An relied on three pitches — four-seam fastball, curve and slider. And 50 of his 72 pitches went for strikes. The Heroes were mulling another option for the ninth. An said after the top eighth, his pitching coach, Brandon Knight, asked him if he’d be willing to go in the ninth. An was one of the top pitching prospects to come out of high school in this year’s rookie class. But he didn’t make his pro debut until May, because the Heroes suspended him for 50 games after belatedly learning that he’d assaulted younger teammates in high school. An was also held out of spring training and had a rough start to this season. He was 2-4 in 20 appearances with a 7.19 ERA, not the kind of numbers that would inspire much confidence in managers. But An’s skipper, Jang Jung-suk, stuck to his gun and trusted the young hurler to come through. And An himself stayed patient through rough patches in the regular season.